Kuala Lumpur (Metro Rail News): MyHSR Corporation Sdn Bhd (MyHSR Corp) to appoint a Technical Advisory Consultant (TAC) to review cost reduction options for the suspended Kuala Lumpur-Singapore High-Speed Rail (KL-SG HSR) project. On April 8, 2019, MyHSR Corp Said in a statement, “An open tender to appoint the consultant, who will review the technical aspects of its recommended option for the project following its revision by the Malaysian Government,” Which was set up in 2015 to undertake the development and implementation of the railway line. 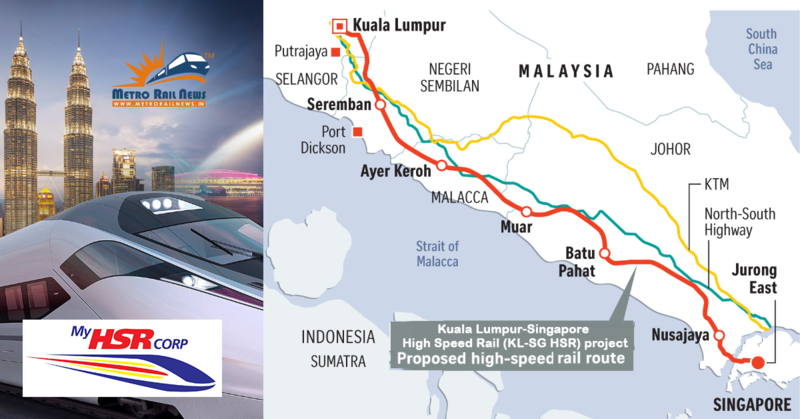 “The TAC will review and validate the proposed infrastructure assets within Malaysia, such as alignment, stations, and High-speed rail (HSR) maintenance facilities to validate the recommendation. MyHSR Corp Chief executive officer (CEO) Datuk Mohd Nur Ismal Mohamed Kamal said the group’s search for a TAC marks a significant development before the end of the project’s construction suspension ends on May 31, 2020. “This tender marks an important step forward before the end of the suspension period in May 2020. We encourage all firms with the relevant experience to participate in this tender as the findings of this review will help us chart the right course for this project,” He Said. The Governments of Malaysia and Singapore jointly suspended the construction of the 350km HSR project on Sept 5, 2018, and seeking the ways to cut the project’s cost from the reported RM110 billion. Due to the suspension, MyHSR Corp has pushed back the commencement of the project service to Jan 1, 2031, from the initial Dec 31, 2026. The HSR is one of a few Government mega projects launched by the previous Barisan Nasional (BN) Government that are currently subject to reviews by the current Pakatan Harapan (PH) Government over-inflated costs.